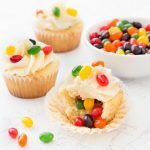 Jelly bean cupcakes are simple vanilla cupcakes decorated with jelly beans inside and out. They are the perfect Easter dessert! I cannot believe Easter is less than a month away! There are plenty of springtime dessert to be made, but I’m especially excited to start using Easter candy in my baking. Today I made jelly bean cupcakes! It’s been awhile since I’ve made cupcakes (going as far back as Christmas maybe!) 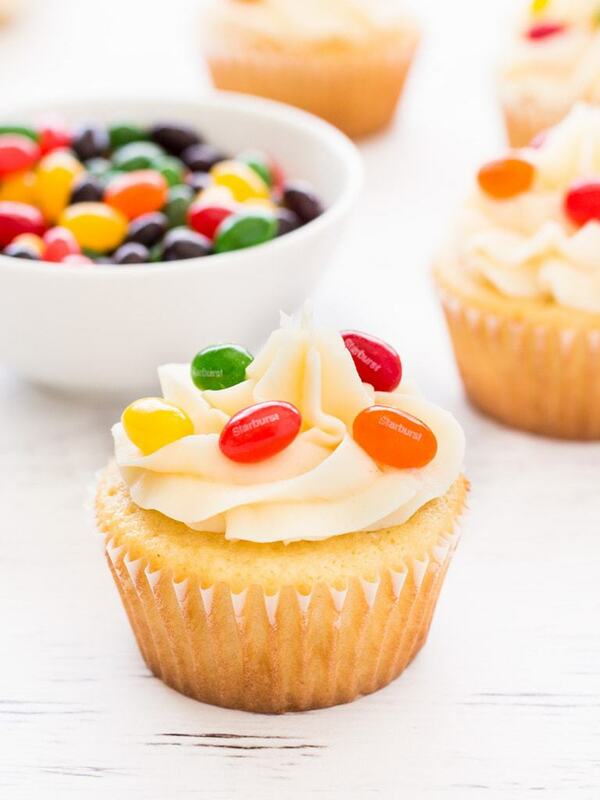 So I was excited to make these jelly bean cupcakes using my traditional vanilla cupcake recipe. I scooped out a small hole in each cupcake and filled it with the Starburst® Jelly Beans. And if that wasn’t enough, I sprinkle more on top of the buttercream frosting. 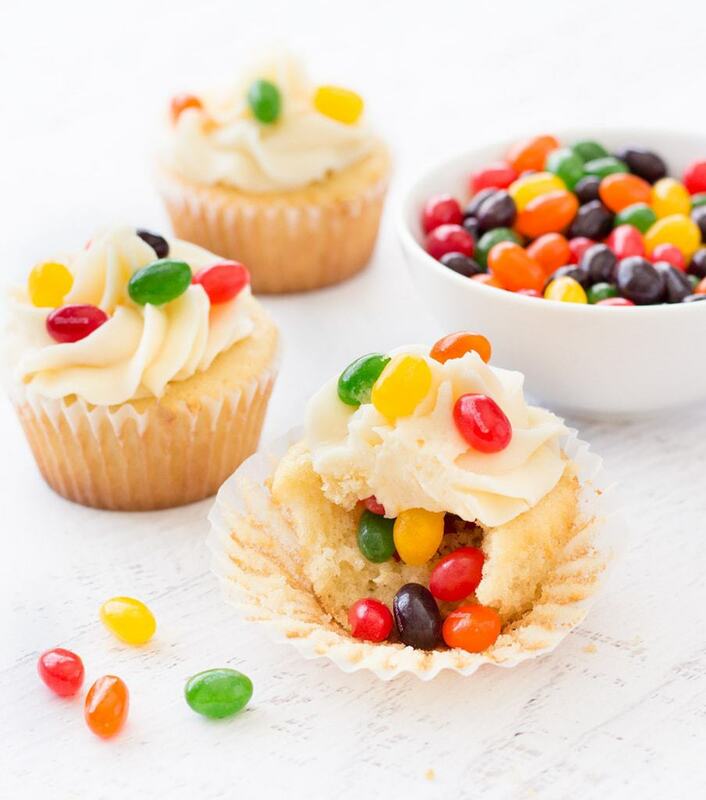 Needless to say, if you are a jelly bean lover, then these cupcakes are for you! To make scooping out the holes in the jelly bean cupcakes easier, I suggest using cupcake corer or a cookie dough scooper (like I did). Of course you can always eye ball it and use a knife or regular spoon. Each scoop was about one inch in diameter and about three-quarters of an inch deep. Each hole fit about six to eight jelly beans—the perfect amount for a surprise when you bite into the cupcake! Then to top it all off, some rich buttercream frosting. 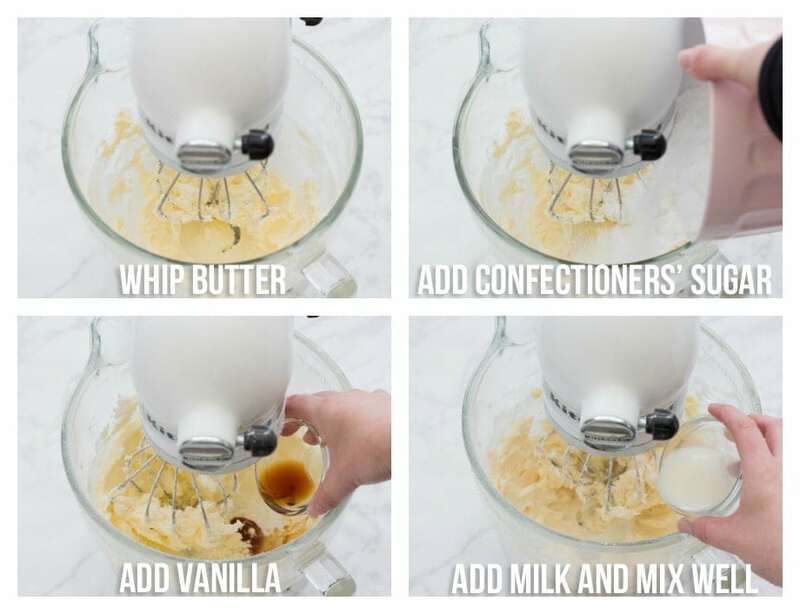 This is my go-to frosting recipe. It is the perfect ratio of butter to confectioners’ sugar to vanilla. It’s smooth, fluffy and rich. If you don’t want to keep the jelly beans a total surprise, I suggest adding a few on top of the frosting as well. It’s a festive garnish and adds a nice pop of color! 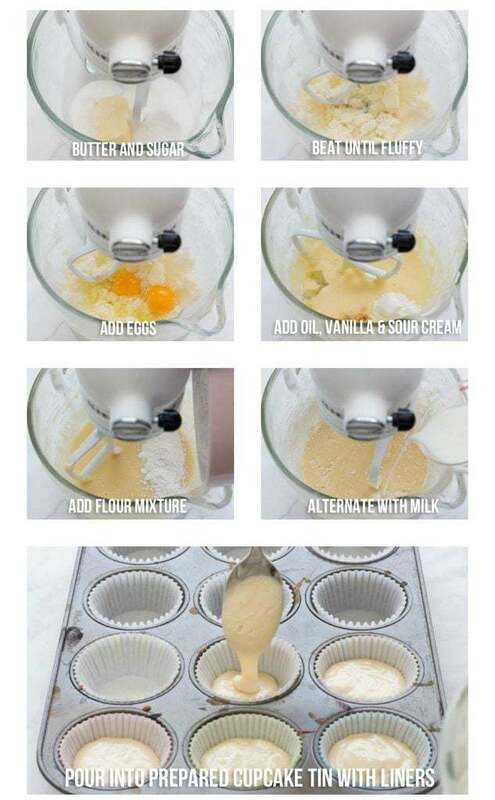 Before you get to the recipe, here are some step-by-step photos of adding the ingredients to make the cupcakes and frosting! In a medium bowl, whisk together cake flour, baking powder, baking soda and salt. Set aside. In a large mixing bowl, cream together the butter and sugar until light and fluffy. Add the eggs one at a time, beating well after each addition. Beat in the sour cream, vegetable oil, and vanilla extract. Gradually add in the flour mixture in three parts, alternating with milk (So it goes flour, milk, flour, milk, flour). Mix until batter is uniform and smooth. Fill baking cups about 2/3 full and bake for 12-14 minutes, or until a toothpick inserted into the center comes out clean. Remove from the oven, transfer cupcakes to a cooling rack, and allow them to cool to room temperature before coring and frosting. With the mixer on medium speed, add the vanilla and salt, and beat for a minute, until fluffy. Add milk until desired consistency is reached. Transfer frosting to a frosting bag fitted with desired tip (I used a large star tip). Using a cupcake corer or spoon, scoop out a small hole about 1-inch in diameter and 3/4-inch deep in the center of each cupcake. Discard scooped out cake. 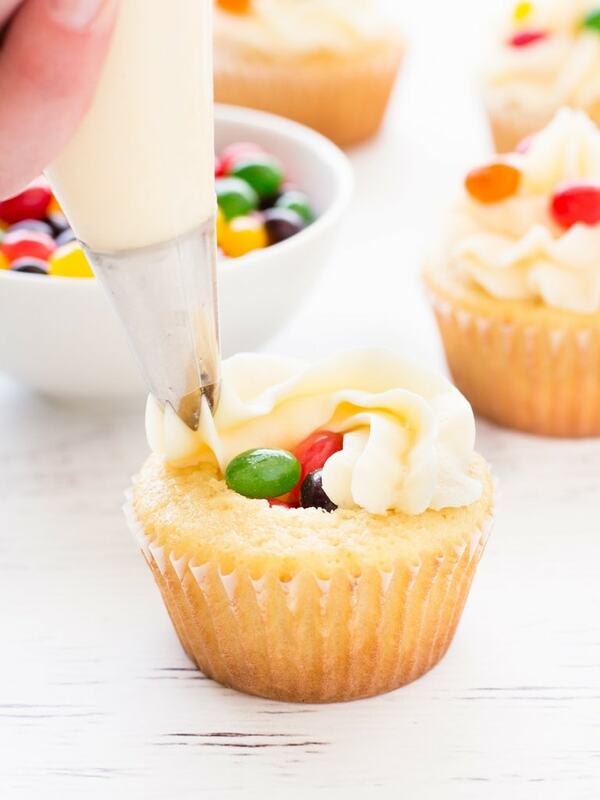 Fill each cupcake with about 6 jelly beans. 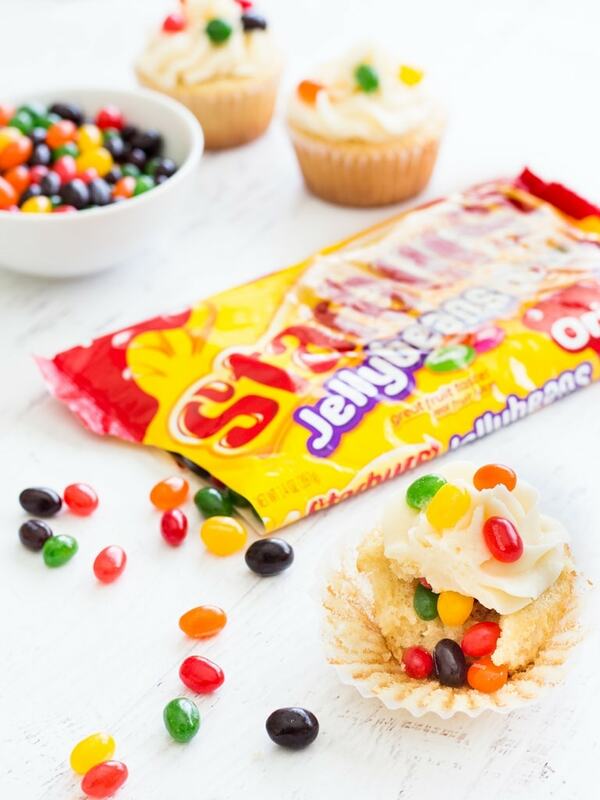 Top the cupcake with buttercream frosting and garnish with additional jelly beans if desired. Serve the same day for best taste. Cupcake recipe adapted from Pastry Affair. Yum! Those look super delicious. I especially love the jelly bean surprise! These are so adorable! I love Starburst jelly beans! Okay, how much cuter does it get!? These are absolutely adorable, and they look stinking delicious. Sprinting to the candy aisle now! Thank you, Karly! They are so cute, aren’t they? ?